t8/lcdrange.h contains the LCDRange class definition. t8/lcdrange.cpp contains the LCDRange implementation. t8/cannon.h contains the CannonField class definition. t8/cannon.cpp contains the CannonField implementation. t8/main.cpp contains MyWidget and main. This file is very similar to the lcdrange.h in Chapter 7. We have added one slot: setRange(). We now add the possibility of setting the range of the LCDRange. Until now, it has been fixed at 0..99. There is a change to the constructor (we'll discuss that later). SetRange() sets the range of the slider in the LCDRange. Because we have set up the QLCDNumber to always display two digits, we want to limit the possible range of minVal and maxVal to 0..99 to avoid overflow of the QLCDNumber. (We could have allowed values down to -9 but chose not to.) If the arguments are illegal, we use Qt's qWarning() function to issue a warning to the user and return immediately. qWarning() is a printf-like function that by default sends its output to stderr. If you want, you can install your own handler function using ::qInstallMsgHandler(). CannonField is a new custom widget that knows how to display itself. CannonField inherits QWidget, and we use the same idiom as for LCDRange. For the time being, CannonField only contains an angle value for which we provide an interface using the same idiom as for value in LCDRange. This is the second of the many event handlers in QWidget that we encounter. This virtual function is called by Qt whenever a widget needs to update itself (i.e., paint the widget's surface). Again, we use the same idiom as for LCDRange in the previous chapter. 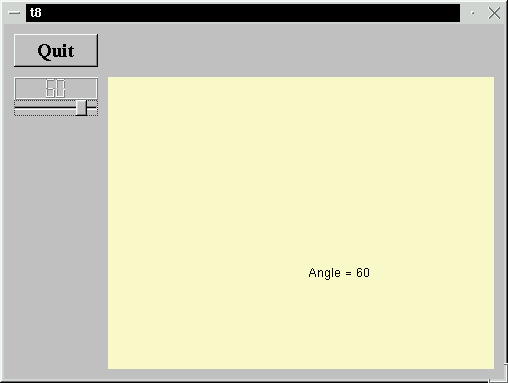 This function sets the angle value. We have chosen a legal range of 5..70 and adjust the given number of degrees accordingly. We have chosen not to issue a warning if the new angle is out of range. If the new angle equals the old one, we return immediately. It is important to only emit the signal angleChanged() when the angle really has changed. Then we set the new angle value and repaint our widget. The QWidget::repaint() function clears the widget (usually filling it with its background color) and sends a paint event to the widget. This results in a call to the paint event function of the widget. Finally, we emit the angleChanged() signal to tell the outside world that the angle has changed. The emit keyword is unique to Qt and not regular C++ syntax. In fact, it is a macro. This is our first attempt to write a paint event handler. The event argument contains a description of the paint event. QPaintEvent contains the region in the widget that must be updated. For the time being, we will be lazy and just paint everything. Our code displays the angle value in the widget at a fixed position. First we create a QString with some text and the angle; then we create a QPainter operating on this widget and use it to paint the string. We'll come back to QPainter later; it can do a great many things. We include our new class. This time we include a single LCDRange and a CannonField in our top-level widget. In the constructor, we create and set up our LCDRange. We set the LCDRange to accept ranges from 5 to 70 degrees. Here we connect the valueChanged() signal of the LCDRange to the setAngle() slot of the CannonField. This will update CannonField's angle value whenever the user operates the LCDRange. We also make the reverse connection so that changing the angle in the CannonField will update the LCDRange value. In our example we never change the angle of the CannonField directly; but by doing the last connect() we ensure that no future changes will disrupt the synchronization between those two values. So far we have used the no-assembly-required QVBox and QGrid widgets for geometry management. Now, however, we want to have a little more control over the layout, and we switch to the more powerful QGridLayout class. QGridLayout isn't a widget; it is a different class that can manage the children of any widget. We add the Quit button in the top-left cell of the grid: 0, 0. We tell QGridLayout that the right column (column 1) is stretchable. Because the left column isn't (it has stretch factor 0, the default value), QGridLayout will try to let the left-hand widgets' sizes be unchanged and will resize just the CannonField when the MyWidget is resized. The LCDRange sets the slider to be its focus proxy. That means that when someone (the program or the user) wants to give the LCDRange keyboard focus, the slider should take care of it. QSlider has a decent keyboard interface, so with just one line of code we've given LCDRange one. The keyboard now does something - the arrow keys, Home, End, PageUp and PageDown all do something vaguely sensible. On Windows machines with an 8-bit display the new background color is dithered to death. The next chapter works around this. If you remove the AlignTop, what happens to the LCDRange's position and size? Why? Leave out the setFocus() call. Which behavior do you prefer? You're now ready for Chapter 9.